You would think the crypto audience should know this, but it is true. People just don't think this way. Price means nothing without volume. a weird day all around. something up? Wish I had some extra fiat to spend myself..
$1 this year? Haha sorry but no way. If this was September I would agree but the year is yet young. I think we should at least get close to $1 by the end of the year. You guys seem all irrationally optimistic. but ofc, i'd love it if it goes above $1 even though i don't believe it really hope it happens! If we successfully implement the asset exchange, transparent forging, and get our own version of Coinbase (there are a couple in the works) that can work with Nxt, then I think $1 is doable. I also think that we'll start getting more digital fiats appearing with the asset exchange, which I think governments and people who don't want to take the same risk with prices, will love. I think $1 within a year is easily doable, $4-5 within 2 years. From there, I think we'll experience steady relatively rapid growth, I was a little over optimistic initially but I think we'll beat Bitcoin in the long run. I think we're the best competition out there, especially if we can get transparent forging working, which seems doable. If there is enough liquidity in NXT AE, then I can probably automate this process with some realtime price discovery and approval. An event such as the $, €, or ¥ crashing could send a lot of folks screaming for a refuge medium like BTC and NXT. It would be anyone's guess if that happened! 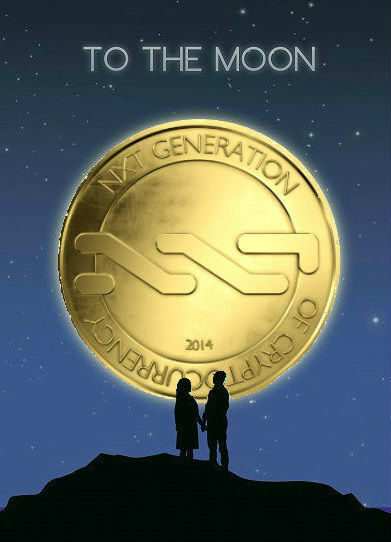 If someone were to develop a site like Ebay using Nxt as the payment method, we could buy all the moons! Hard time for every cryptos! You mean wonderful time to buy? what kind of company are you talking about? is it secret atm? if yes, just tell us, if this company is well known or if it's a small one.